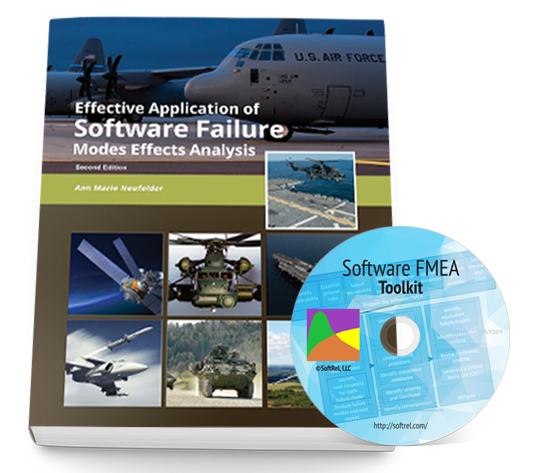 This is a bundled package consisting of Effective Application of Software Failure Modes Effects Analysis – 2nd Edition & Software FMEA Toolkit. The purpose of this toolkit is to provide a FMEA template that accommodates the several hundred software related failure modes and root causes as well as the 6 software specific viewpoints. 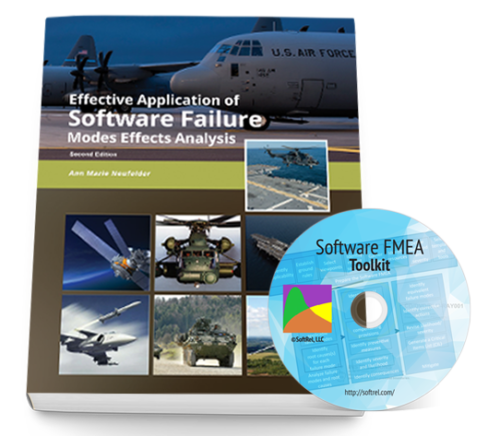 This toolkit compliments the “Effective Application of Software Failure Modes Effects Analysis” book. This product follows the "Normal" discount schedule. Click here for details. The second edition includes additional examples for the functional, interface and detailed software FMEA viewpoints, examples of what a software FMEA should not look like, examples of the difference between a preventive measure, compensating provision and corrective action for software related failure modes, and additional guidance on how to assess the likelihood of the failure modes. The SFMEA works in much the same way as any other FMEA with the exception of the viewpoints and failure modes. For the reliability practitioners and software engineers the most difficult part about a SFMEA is getting starting. This toolkit was developed to make the SFMEA construction process easier for both reliability practitioners and software engineers. This toolkit is a spreadsheet that has the set of SFMEA steps, discussed in the “Effective Application of Software Failure Modes Effects Analysis” book, in easy to use worksheets. The toolkit includes the failure modes and root causes discussed in the book as well as guidance for identifying which of the failure modes is applicable to your system. The spreadsheet also has template worksheets for each of the 6 applicable SFMEA viewpoints. The spreadsheet can be used to document the Software FMEA. The toolkit allows the user to create a SFMEA for several different products and systems under a single user computer license. The user can tailor much of the template text to fit the needs of their product and industry. The user of this toolkit must have a version of Microsoft® Office Excel that is not older than 2010 as well as a Windows® Operating System that is not older than Windows® 7. The user must also have the ability to enable Macros. Administrative privileges are required to install the toolkit. The technical support for this product is limited to activation of the license. For additional support contact sales@softrel.com. The below shows one of the viewpoints. The user is provided with templates and guides for completing the SFMEA. The failure modes and root causes are contained in pull down menus to expedite the analysis. This product is licensed to exactly one computer. Once the toolkit is installed and the activation code is received, it may not be transferred to another computer. Copyright © 2017 by Softrel, LLC. This toolkit and its associated documentation is protected by U.S. Copyright Law and may not be copied, automated, re-sold, or re-distributed to multiple users without the express written permission. The copyrighted work may not be made available on a server for use by more than one person simultaneously without the express written permission. If multiple simultaneous user access to a copyrighted work is desired, please contact support@softrel.com for licensing information.